DataSunrise Data Discovery for Teradata enables organizations to locate and categorize enterprise data in order to effectively identify resources requiring protection. It is also an essential component of compliance readiness. The tool contains built-in search filters for various data types including personal, financial and medical data. Users are enabled to create their own filters as well. To protect critical business data effectively and efficiently it is essential to start with discovering where sensitive information resides and estimating the level of its exposure. Sensitive business data is not limited to personal information of company's clients and employees only. It is basically any information that can be used against the brand in case it is not appropriately protected. DataSunrise Data Discovery for Teradata is the fundamental and essential tool designed to identify and locate sensitive and regulated data across multiple databases. After finding the database records containing data that matches the pattern, masking and security rules are created to limit the access to the group of authorized users only. 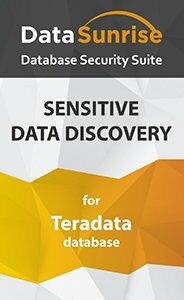 DataSunrise Data Discovery is a powerful tool which allows organizations to achieve complete data visibility, provide continuous and comprehensive monitoring of data access and activity, ensure on-going risk management and support the ability to keep protective controls in place based on pre-defined security and masking rules. The feature also helps to meet regulatory requirements and stay compliant with HIPAA, PCI-DSS, SOX, GDPR, etc.